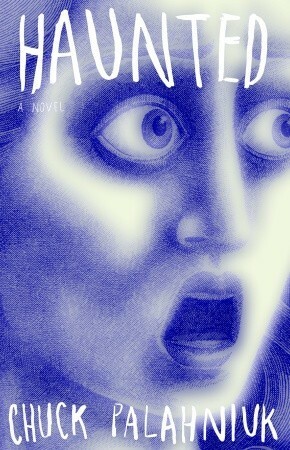 Haunted is a collection of short horror stories tied together by one story that threads together the others. I do not recommend this collection for anyone who isn’t already a horror fan. If a reader has any concerns about gore or offensive material, then I wouldn’t recommend this. This is a much more challenging book than Fight Club, and liking Fight Club isn’t a good predictor on whether a reader would like Haunted. The general idea is that a patron of literature has offered a small group of amateur writers the chance to get away from it all in order for each of them to write their masterpiece; however, no one will know where they’ve gone and they won’t have any contact with the outside world. The writers who become involved with this effort are not, shall we say, on the up-and-up, and look forward for the chance to disappear for three months, even more than they look forward for the chance to write without being disturbed. Which is just as well, because disturbed is what they get. This collection contains Palahniuk’s infamous short story “Guts,” which is supposed to have made several people faint with how repulsive the story is. The story is one of the finest examples of gross-out horror that could ever be envisioned, not even barring Stephen King’s work, but I believe the real cause of the fainting is that the story starts off by telling the reader to hold their breath! Terrible things happen, and I have to warn you not to look for a happy ending. In addition, don’t expect the supernatural. Palahniuk finds enough horror within the human species to satisfy without turning to something outside it. I would recommend this book for older teens and up, people with strong stomachs only. The book is darkly funny, and is really the most vicious of satires rather than horror–but it almost requires an understanding of how horror works in order for the satire to work. Reading this book will make things like Saw and Hostel look like lightweights; it may also introduce darkly cynical horror-movie buffs to the enchantments of satire as a literary art.